Everyday our brain processes sensory stimuli through our five senses. And sometimes, for our students, their brain receives an overload of stimuli or lack of stimuli. That’s where we come in. We need to help them cope with the lack of or overload of stimuli school causes for them. One super simple fix is something that costs about $1 (per student) and can be made by the student… say whaaatttttt! 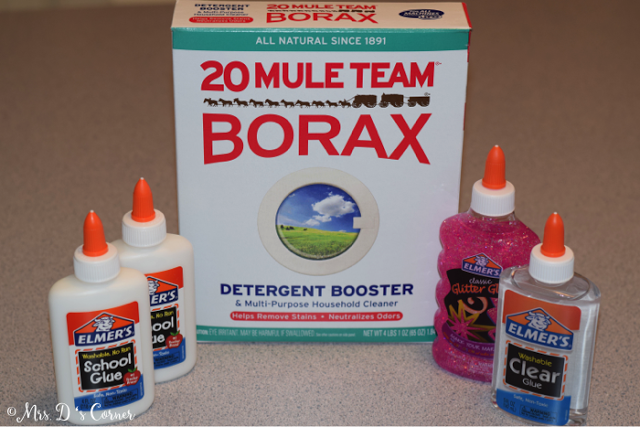 Supplies you’ll need include borax (you can find it in the laundry detergent isle at the grocery store), water, and Elmer’s Glue. Total cost: box of borax was $4 and regular school glue was $1 per bottle; glitter glue is more expensive at about $3 a bottle. You’ll also need this free download. Kitchen supplies include a measuring cup, a teaspoon measuring spoon, and a bowl. It can be any bowl, just know that you’ll be putting glue in it (it does come off!). 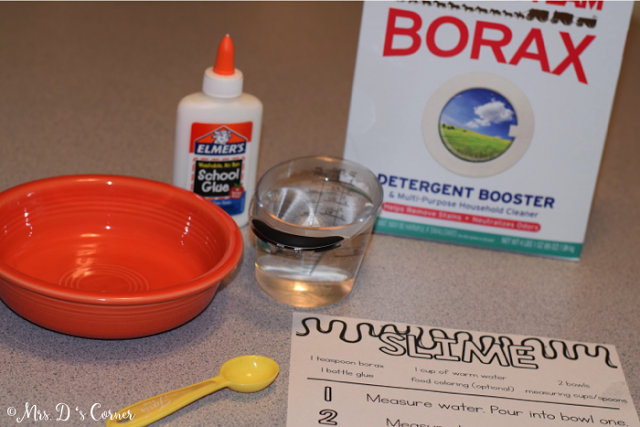 The free recipe for slime comes in two differentiated, leveled versions. Simply follow the recipe steps. 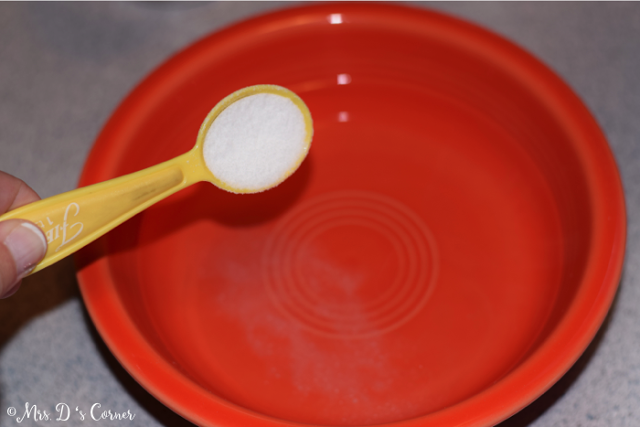 Add one teaspoon of borax to the warm water in the bowl. 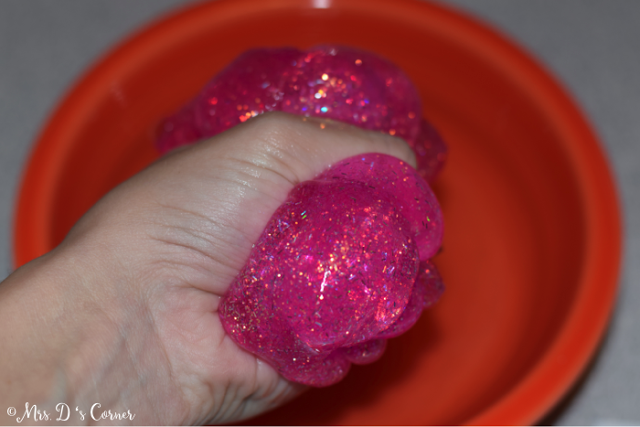 Hands work best to knead the slime into more of a solid, but you can use a spoon. Most of the time, this is a student’s favorite part because – hello sensory input! 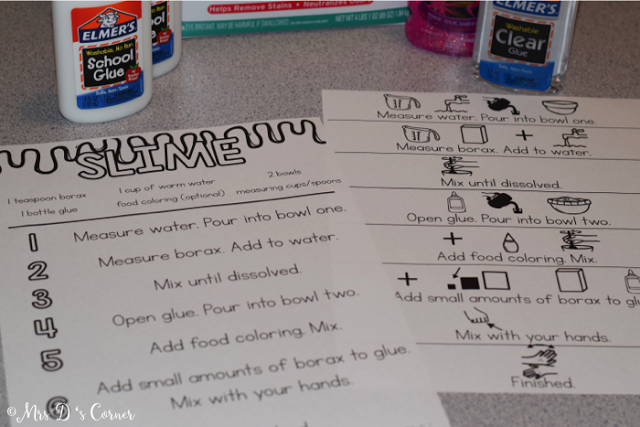 Glitter glue works great for this slime recipe too. 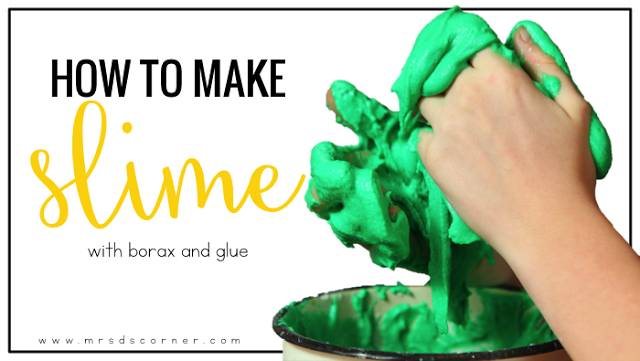 It will be a little harder than the regular glue once the student kneads it, so maybe add less borax. 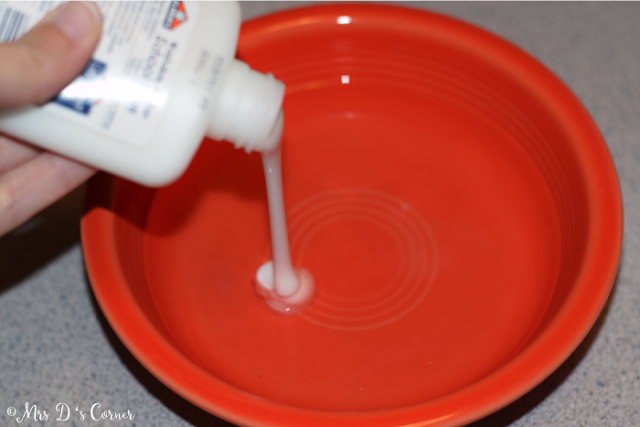 Once your student seems to have made the glue into a solid, they can put it on the table and continue to play with it. Make sure they get all of the bubbles out of it and that the actual glue mixed with the borax particles. Note* more than likely, students will have sticky fingers after mixing. 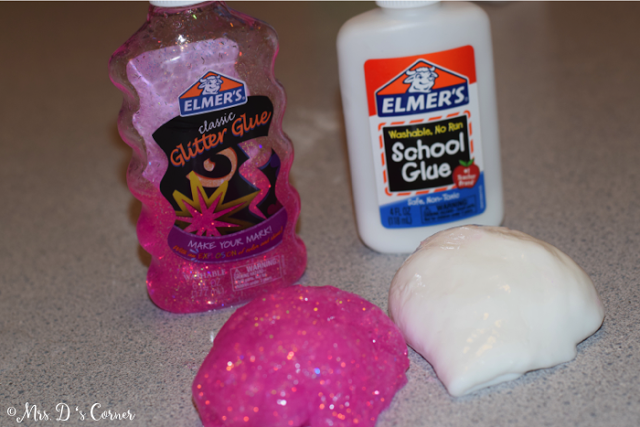 We made two different slimes… one with glitter glue and one with regular school glue. 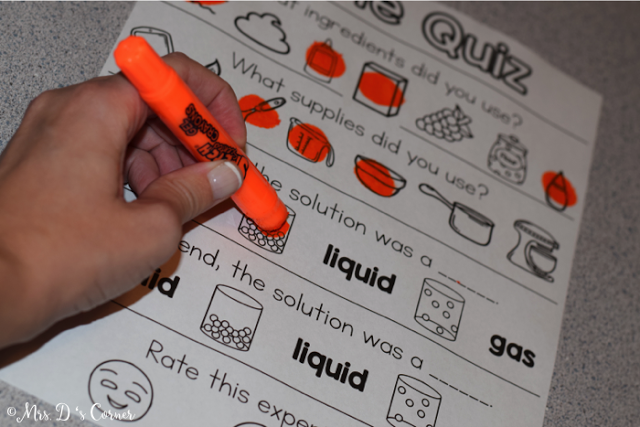 After completing the activity, you can give students the quiz or you can complete it as a comprehension activity afterwards. I enjoy seeing how my students rate the experiments we do in class. It helps me to know what types of activities they like to do more over other ones. If you enjoyed this visual recipe experiment, you might also like my Fun Food Friday recipes. This bundle will span you the length of an entire school year with a different no bake recipe every Friday. 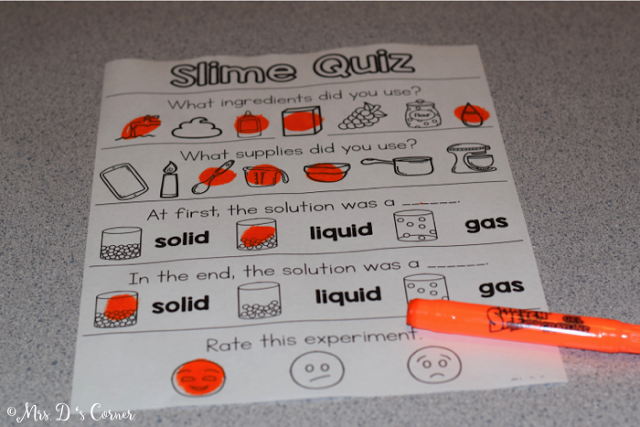 What experiments do you students love?